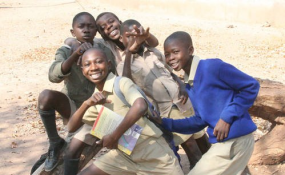 Young students in Zimbabwe (file photo). Progressive Teachers Union of Zimbabwe (PTUZ) president Takavafira Zhou says Zimbabwean teachers' wages have now diminished to a paltry US$75 if converted to the more stable foreign currency. In a statement Saturday, Zhou echoed the demands by the Zimbabwe Teachers Association for educators to be paid their wages in foreign currency. This follows sweeping price increases recently with goods and services now three to four times their original value while some businesses are now demanding foreign currency for the same products. "The current erosion of teachers' salaries calls for an urgent intervention by government to restore some semblance of sanity and protect teachers from becoming miserable," Zhou said. "Fundamentally, October has seen the value of the bond devaluing drastically so much that a teacher's salary in bond is less than US$75. "That there is need to use the US$, pula and rand to stabilise our economy is more real than apparent. Any other claims of a 1:1 bond to US$ ratio is a tissue of misrepresentation." When central bank governor defiantly introduced bond notes in 2016, he argued it was pegged at the same rate with the US dollar. However, the bond note has seen its value plunge with one now required to fork out anything close to $400 in local currency to buy just US$100 from the black market where it is readily available. Zhou said among some of the reasons teachers should be paid in foreign currency was because when salary negotiations were last made between them and their employer, they were all talking in US dollar terms. "Current salaries were negotiated in foreign currency and 'bondirising' them is tantamount to unfair labour practice. "'Bondirisation' of salaries has greatly eroded teachers' salaries... prices of available goods are sky-rocketing while the bond is becoming worthless." The PTUZ chief said local shops and pharmacies have pegged available goods and medicines against foreign currency while medical aid schemes have become "virtually useless". "Drs are demanding cash upfront pegged against foreign currency," he said, adding that teachers were "a vital cog of societal development whose respect and dignity in society must be maintained in order to achieve quality public education by 2030". "The government cannot entrust the future generation and development of the country to hungry, poor and miserable teachers," he said. Government is however yet to respond to the teachers' calls for foreign currency wages.